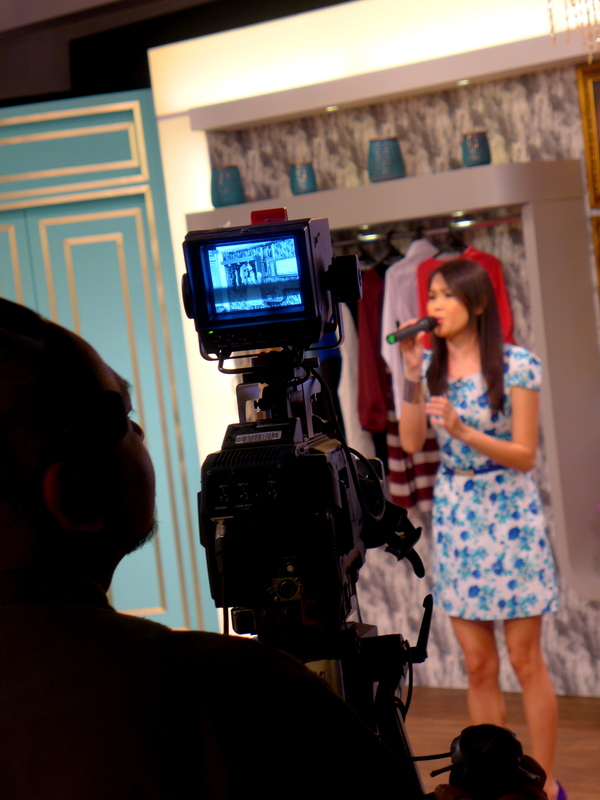 Yesterday was a very important milestone for me: my first live TV interview and performance! When I opened the email sent by the producer of Bella NTV7, my heart literally skipped a beat. 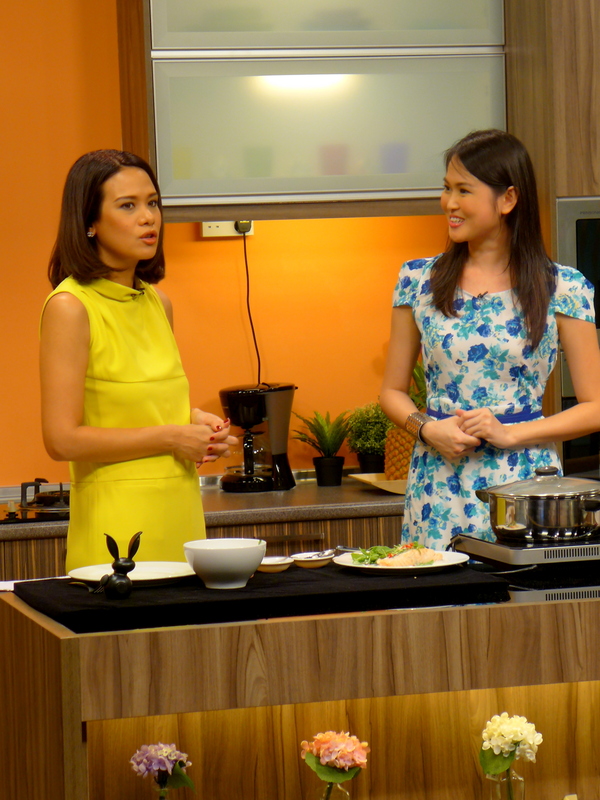 At first I thought it would just be an interview, but they also requested for me to sing as well as demonstrate a healthy dish. What an honour! I spent a week stressing about this: outfit, song choice, dish to cook, etc etc and finally the day arrived. I was a little shaky at this point but luckily didn’t forget any lyrics. It was a strange experience because throughout the performance, I was directed to look at different cameras at different timing. Finished the song without collapsing on the floor, which was a good start. Haha. By the way, I sang “Moving On”, one of my originals, you can take a listen here. I looked so serious here. She asked some really good questions and I was more together at that point so hopefully the interview sounded alright. I think my dress really blends with the floral background. Moving on, to the kitchen! 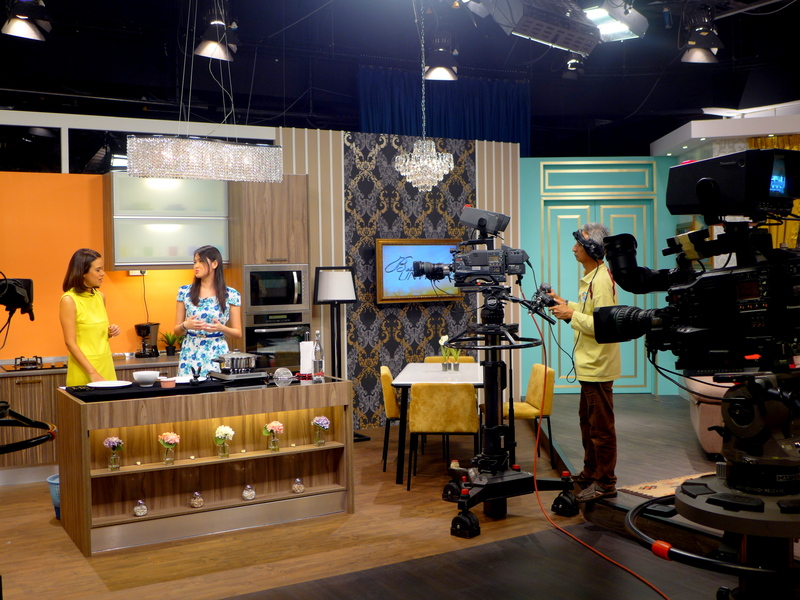 After the commercial break, we moved to the brand new kitchen (it is a brand new set by the way). I’m proud to say that I’m the first person to actually cook in the studio! We talked about the Paleo Diet, and some common misconceptions people have with eating healthy. While I cook a very simple but delicious dish: Poached Salmon in Coconut Milk (recipe to follow later). Looking slightly more animated than before. Probably cause it was the end of the interview. Spot my dish on the table? Well, that was definitely a good learning experience for me. I hope there will be more shows like this to come and maybe this singing cook thing can really take off! By the way, that dish was delicious and Elaine definitely enjoyed it. We fed the staff after the show and they were most appreciative too. They wanted something fast, simple and healthy. Special request: something that doesn’t produce smoke. Hence this recipe was born! I am currently going through a Thai Food phase so it does have a little Thai influence. The aroma of the coconut milk broth is incredible and this only took no more than 15 minutes to cook. Suitable for busy career women, mums, students and basically everyone who loves fish. Place the coconut milk, vegetable stock, garlic, ginger, lemongrass and shallot in a small pot/pan with lid. Bring the mixture to a boil then reduce to simmer for a few minutes. Season to taste. Add the Salmon fillets, keeping the heat low. Cover and cook for 4-5 minutes (turning once), depending on the thickness of the fillets, or desired doneness. Be careful not to overcook. Carefully remove the fish from the poaching liquid and set side on a dish while let the liquid continue to simmer on a higher heat. Stirring occasionally to prevent burning. 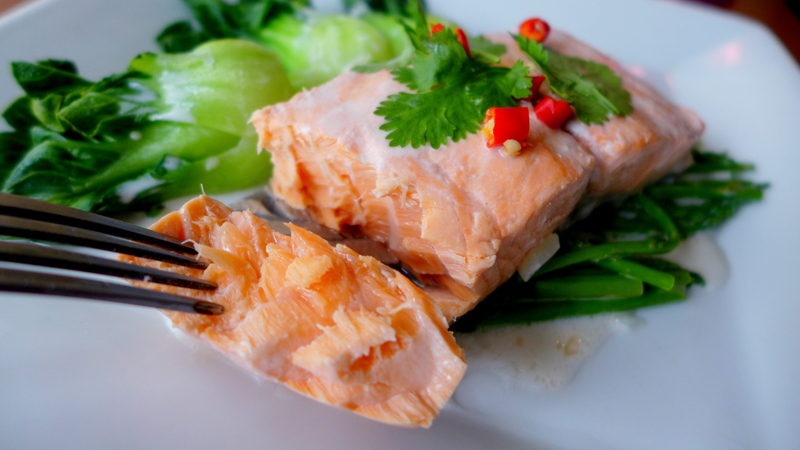 To serve, place the salmon fillets on individual plates, pour the reduced broth over the fillets and garnish with coriander, arugula and sliced chili. Enjoy with a side of steamed vegetable of your choice. I served mine with Arugula on the show, and with bok choy and asparagus at home. I like my salmon still slightly raw inside for that tenderness. 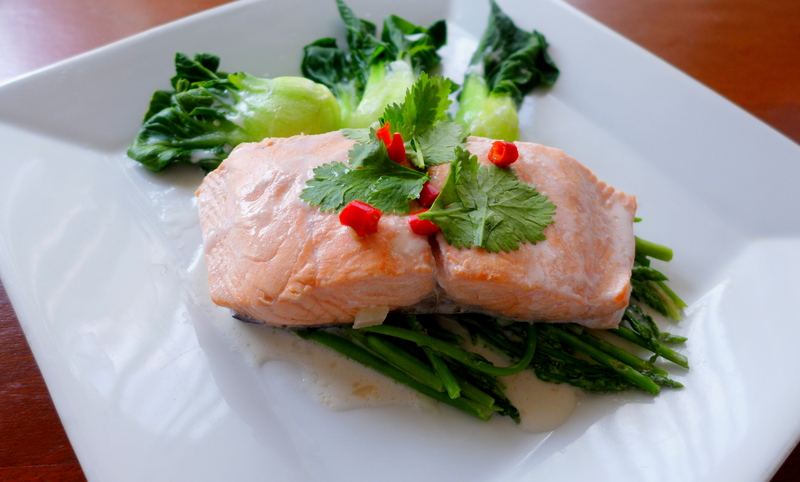 You can choose to let it go for a little longer but salmon cooked this way will be quite soft and silky anyway. If you missed out on the show and want to catch it online. You can log on to http://www.tonton.com.my and look for episode 223. Bravo!!! That’s really good, your own original song – love it…love the “you might think that I’m crazy, you might not understand” part especially…great lyrics! And that’s quite a dish…the fish, I mean…ah well, ok lah…you too!!! LOL!!!! 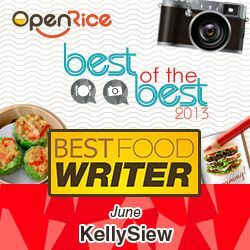 congrats Kelly! 🙂 you look great! 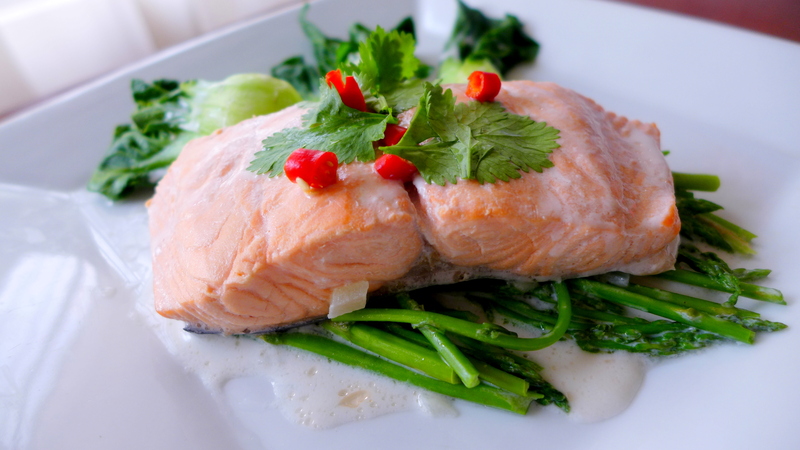 salmon and coconut milk sounds interesting… looking forward to trying out your recipes, as always. Thank you! Yeap another quick and delicious recipe for you to try. i read your article regarding healthy diet for better hair in “weekly runner” today. Ohh! Welcome! Thanks for dropping by. Thank you for being a supportive friend!